Usually , when we make kofta curry or kofta in gravy , we always fry the koftas first so that they remain intact in the gravy . But today I’m sharing a recipe , where there is no need of prior fryinf and they taste so good . I used cconut milk and cream in the recipe for the gravy , but if you are not a coconut milk fan , omit it and use yogurt instead . For the special garam masala powder grind 4/5 cloves, half a teaspoon black pepper, half a teaspoon cumin seeds, half a teaspoon whole coriander, 3 cardamoms, little amount of joyetree/ mace together. 2. Now shape them into small round ball as kofta . 3. Heat oil/ ghee . Fry the whole garam masalas , that is cardamom, cinnamon and bay leaves. Now add ginger paste , garlic paste . Add little water and add the fried onions . Now add turmeric, chili powder and salt.Cook very well adding water little by little . Add the coconut milk and reduce the gravy . Add heavy cream . Now lower the flame of the stove , add the koftas carefully . Must be at low flame. Don’t add the koftas when the gravy is boiling . The gravy should be simmering in low heat in order to prevent breaking up the koftas . Cover the lid . Cook for few minutes then turn over the koftas carefully. Cook another few minutes until they are done . Add few whole gren chilies and special garam masala powder .Keep it on them for another 5 minutes . 4. You may sprinkle some keora water before serving. 1. 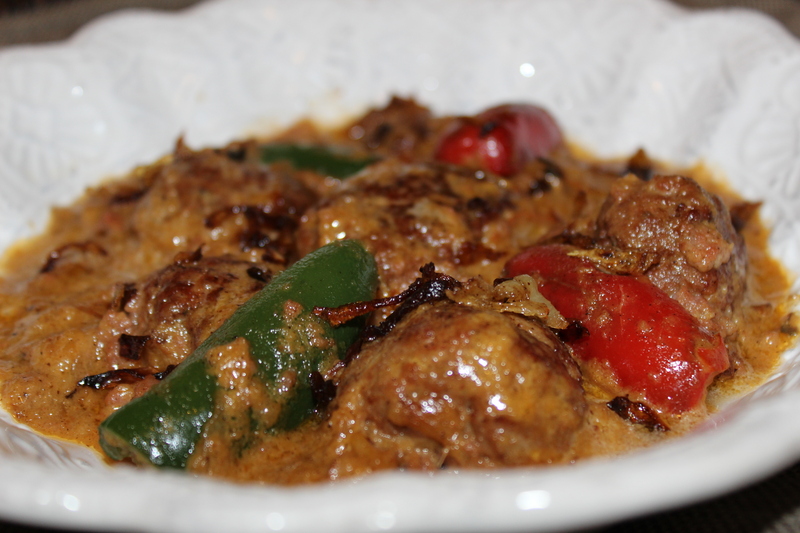 Cook the koftas in gravy in low heat with lid on . The steam should help the koftas to be done . 2. If you are not fan of coconut milk add 1/3 rd cup of beaten yogurt with 1/3 rd cup of water . Don’t forget to add 1 tea spoon sugar also . My special egg kofta in coconut milk , mustard gravy!!!!!!!!!!!!! 1. Heat oil and then add the bayleaf. Add the onion paste , ginger paste, garlic paste . Add little water , now add the chili, turmeric powder , salt. Cook well adding water little by little . 2. Mix the mustard paste into coconut milk. Add into the spices. Add another cup of water . Now add the sliced kofta pieces. Cook in the medium low flame . The gravy needs to get into the kofta . 3. When The gravy is reduced, add the whole green chilies . Cook for another few minutes. When it comes to the desired consistency , turn off the heat and keep it on the stove with lid on . Serve with hot plain rice or khichuri or even with polau/pilaf!!!!!!!!!!!!! !